Wild West Revolver Hook Organizer - 4 Hooks | BUDK.com - Knives & Swords At The Lowest Prices! Don't let a bland, unsightly coat rack scar your otherwise-impeccably decorated home! 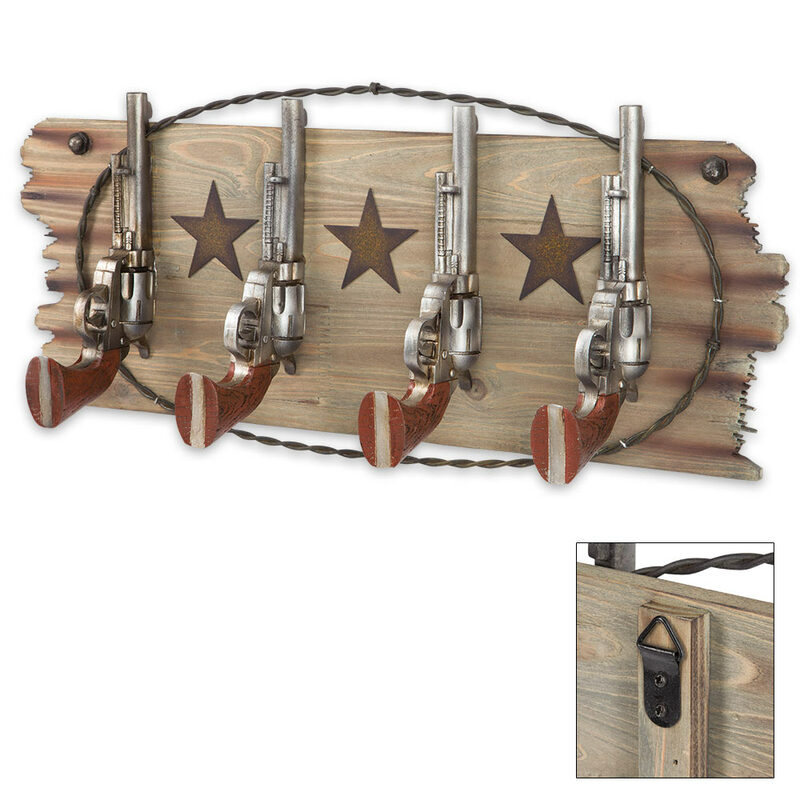 Stow your jackets, hats, bags, keys and more on the vibrant, eye-catching Wild West Revolver Hook Organizer, instead! 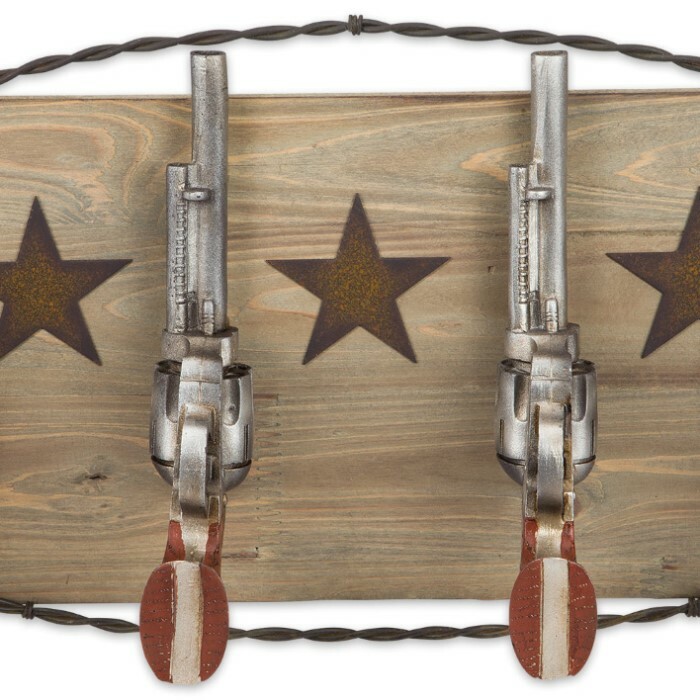 This wall-mounted organizer ditches boring, nondescript hooks in favor of a fun, decidedly more adventurous equivalent - classic, Western-style pistol replicas! The beautifully detailed, undeniably unique "hooks" are anchored to a rustic faux wood backboard, which includes easy-to-use metal wall-mounting hardware. As practical as it is beautiful, this flawlessly cast polyresin organizer is sturdy enough to bear the weight of even the heaviest backpacks, winter coats and more! I bought this a while back for $10.00 plus free shipping and it is phenomenal, the detail is amazing..I use mine for hanging up my Western ball caps (hats) and the revolvers look so real that people always give it a second look.. I love this organizer but wish that they still sold the rattlesnake organizer as well, but it's been discontinued.. 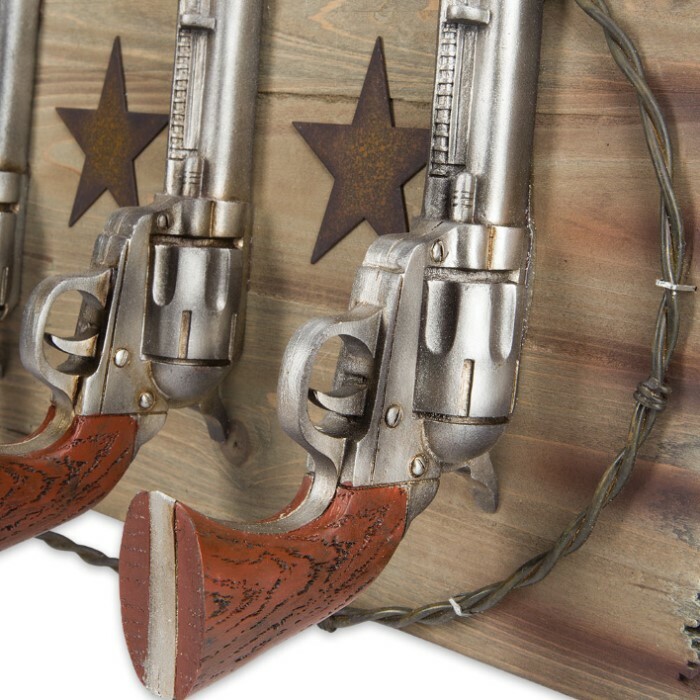 If you are looking for something to go with your Western theme or something that you want to put in your man cave, buy one you will not be disappointed, the revolvers are very highly detailed..Thank You Bud K..
Great quality looks great better than what I expected . Any gun collector would love this. Got for a christmas gift for my husband he's going to love it. Thank's- y'all have top quality products. This is a very nice peace, added small hooks to the botton part to hang all our car keys. Every one lovves it. This is a must have! Guns in detail, perfect for that man cave!